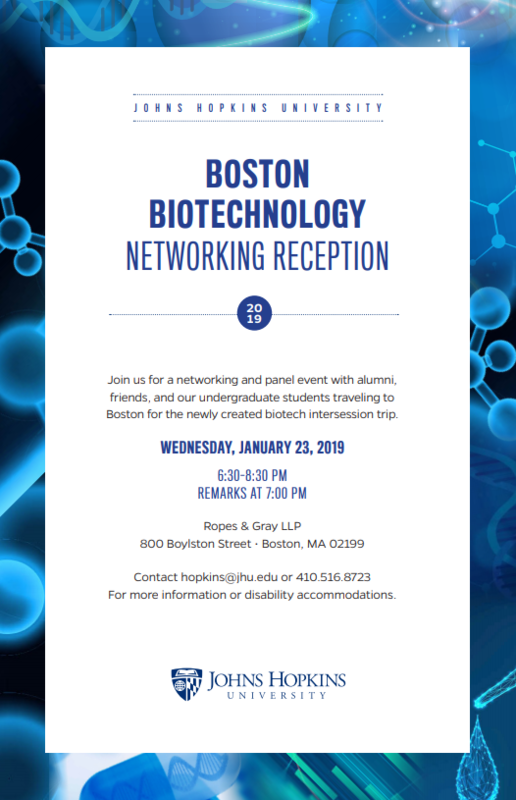 Last week, the Hopkins Biotech Network Affinity hosted an evening of networking and conversation as they welcomed a group of intersession Johns Hopkins undergraduates to Boston, MA at Ropes and Gray LLP in an exploration of biotechnology careers. 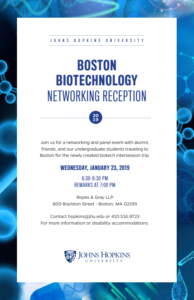 Our alumni panel shared their career journeys and explored hot topics in biotech through a variety of professional lenses. This event was coordinated by JHU Associate Director of Affinity Engagement and alumnus Vicky Schneider (Education). 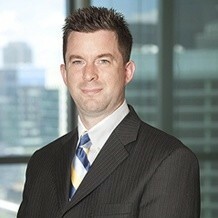 Dr. Sewack is the Director of Internal Discovery at RA Capital Management. Gerald’s primary responsibility is to leverage RA Capital’s TechAtlas platform to identify differentiated opportunities for new venture formation. Gerald holds a PhD in Molecular and Cellular Biology from Harvard Medical School and a BA in Biology from Johns Hopkins University. His research investigated chromatin structure and transcription factor binding. He worked previously at Global Prior Art, an intellectual property analysis firm, as a Partner and the Director of the Life Sciences Division. 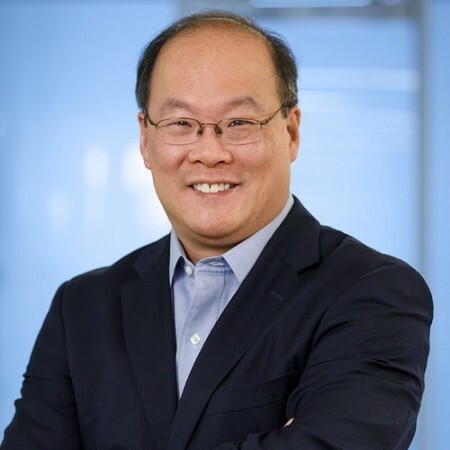 Dr. Ho is the Chief Medical Officer of Boston Pharmaceuticals. He received his B.A. in biology from The Johns Hopkins University and his M.D. and Ph.D. (pharmacology) degrees from Yale University, then completed pediatrics residency at The Children’s Hospital of Boston followed by clinical fellowships in pediatric hematology/oncology at the Dana-Farber Cancer Institute and in clinical oncology and regulatory sciences jointly through the U.S. FDA and the NCI. 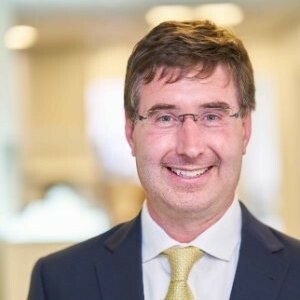 He began his career in drug discovery and development at the Investigational Drug Branch of the Cancer Therapy Evaluation Program, NCI followed by positions of increasing responsibility at Novartis and DuPont Pharmaceuticals. He subsequently served as Senior VP of the Oncology Center of Excellence in Drug Discovery at GlaxoSmithKline and VP of Oncology Clinical Development at Johnson and Johnson. He was co-Founder and President of BeiGene Ltd. and most recently served as the Chief Medical Officer for Epizyme Inc. where he led the company’s clinical development, translational research and regulatory affairs functions. Dr. Adams is retired from the National Institutes of Health in 2015 after twenty years of service during which she was an investigator for myositis and other autoimmune diseases covered by intramural National Institute of Arthritis, Musculoskeletal and Skin Diseases, medical officer for HIV treatment studies sponsored by National Institute of Allergy and Infectious Diseases (NIAID), Chief Medical Officer and then HIV Vaccine Clinical Branch Chief, in the Vaccine Research Program, NIAID for HIV vaccines. Working for NIAID on HIV during those times, she had the wonderful opportunity to collaborate extensively with many international researchers and visit their sites in Africa, Latin America, India, and Thailand while overseeing multi-center research clinical trials. In 2015, she started work at the Henry M. Jackson Foundation for Advancement of Military Medical Research (HJF), which partnered with NIAID and then the U.S. Military HIV Research Program (Walter Reed Army Institute of Research), which also has a long history and ongoing commitment to international collaborative research efforts on the prevention, care and treatment of HIV/AIDS and other emerging infections such as Ebola in order to support the US Armed Forces safety and health. 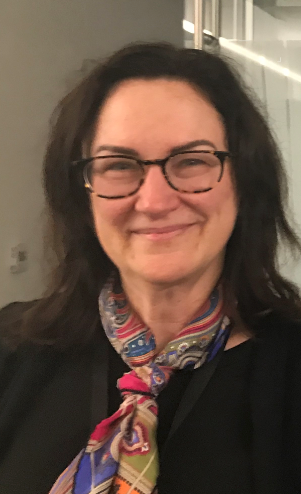 After writing assisting HJF on renewing their five-year $800,000,000 grant for HIV vaccine research in the US, Europe, and Africa, she moved to Takeda Vaccine Business Unit to serve as Medical Director in their Dengue and Norovirus programs. located in Cambridge, MA. She currently resides in Lexington, MA, with her husband, Patrick G. Swann, Ph.D., who works at Amgen, and one of their two young adult children.